Fintech companies are changing the financial sector right now, and there are no prerequisites to think otherwise about the future as well. It takes a short comparison to see where the technology has led us regarding banking, both corporate and personal, financial management, audits and so on. Aging. Even the perfect devices and software are aging, and it takes its toll on how well the business is conducted in the financial sector. Time gives birth to new challenges and threats. By using only top-notch means, one may secure the company and make it move forward rather than become forgotten. A fight for consumers. As the population becomes more digital and mobile; as Millennials become the main driving force of the economy, the customers are more inclined to use technology for anything, including banking and insurance. People strive to use something that is simple, reliable and efficient, regardless of the industry. With financial services being a crucial part of modern society, the organizations are also vulnerable to losing customers when a more skilled and technically advanced competitor enters the market. Withstanding competition. Continuing the thoughts from the previous paragraph, we would like to assert that innovation is currently one of the main factors that shape the financial services market. Technology unlocks possibilities in the areas of safety, transaction speed, collaboration with other industries, etc. Not utilizing these chances to improve creates gaps in the market which are then filled by visionary startups like PayPal back in the day. These factors are a part of digital disruption that has hit the global market already. Enhanced by industry expectations (safety, reliability), responding to new threats may only be possible by creating new solutions or funding those who would do that for the organization. At this point FinTech companies become an immense part of the game, being able to dictate the direction of innovation at some point. Just one discovery, one improvement can shake the whole financial sector and open possibilities never available before. It was the case with the emergence of Blockchain; it is the case with more in-depth studying of Machine Learning, Robotics, and Big Data. It's time to analyze the use cases of the most advanced technologies; see how fintech becomes a significant part of the financial sector and how even the smallest startup with a bright idea can attract huge investments from the leaders of the market. Financial technology experts that work their magic in the form of startups or outsourcing companies that can do the job for existing players are scattered across all technologies and areas of implementation. 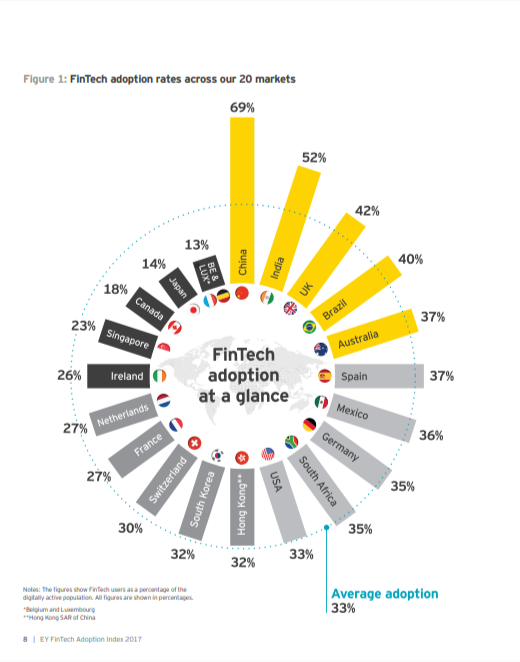 FinTech has already become mainstream among financial sector, according to 2017 EY FinTech Adoption Index. One out of three digitally active consumers is using financial technology solutions for better convenience and results. It is now clear that despite fintech being already huge, it still has tons of potential to grow and improve financial services as a result. EY has created this infographic to visualize the pace of fintech being adopted across the globe. When talking about financial technology and ways to improve financial services by it, one will inevitably face the implementation of new tech and techniques, covering either software/hardware or conceptual aspects of the industry. Top fintech companies have established themselves as those who are continually exploring opportunities to evolve what we have and to create something that was previously unknown. With the world going mobile and digital, areas like Machine Learning, Big Data, Robotics, etc. are seen as a source of both optimizing the business and providing more value to the customers, gaining the upper hand in the race for users. Biometrics. A new step in security. Users are no longer required to remember all passwords - fingerprints, face scan, eye scan and so forth - the technology allows even more secure authentication with less effort from the customer. Chatbots. Based on AI and improved using machine learning, chatbots save tons of money and time by letting support crew focus on the most challenging issues when the chatbot answers inquiries, redirects users and explains more straightforward concepts. It results in better customer retention, conversion, and satisfaction. Blockchain. Financial sector benefits from its transparency and security. Smart contracts also take the contract management to the next level, leaving a lot of tinkering and manual adjusting in the distant past. As a relatively unexplored field, it is yet expected to reach its full potential in the future, mostly with the help of financial technology experts. Big Data. Large financial organizations sooner or later face a huge data turnover. Big Data helps to structure it and extract the needed bits in a matter of seconds. It allows a better reaction to identifying untrustworthy payers, more efficient collection of user data, enabling more personalized experience for everyone and so on. These technologies are only making their debut on the massive financial stage. We can expect their share to grow and more advanced solutions based on AI, Blockchain, Robotics, and other digital developments will appear. This vast field of possibilities to explore leaves us with another conclusion to make. The availability of technology has shifted the market balance. New startups or outsourcing service providers are now more likely to partner with a financial institution. As more of those desire, or are forced to, change, the demand for highly skilled developers, will rise. It will eventually result in market stability and improvement of quality. The fintech companies need to ask reasonable compensation for high-quality products. It contributes to how skilled the market is and how well it tackles the pressing issues, making the options on financial services market more diverse and reliable. With the competition among banks, insurance companies, financial security providers and so on, smooth work of existing services (online banking, one-click insurance, etc.) won't be enough to win customers. Economic enterprises will have to innovate further, making the services more reliable and straightforward to use which will only benefit the financial sector itself, alongside its customers. The competition within the financial industry that is based on digital technology is backed by solid results of Fintech Survey Report CFA Institute 2016. People acknowledge the huge role of advanced technologies in fintech and expect its influence to grow further. 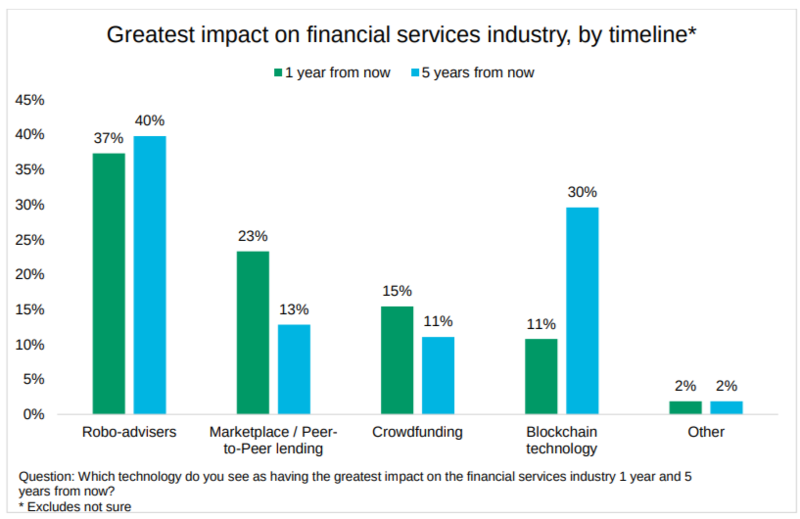 FinTech service providers capitalize on existing technology, providing better solutions. This, in turn, makes the market denser and competition for innovation becomes even more significant. The combination of these factors leaves no margin for a second thought - the race for better value and technology will result in breakthroughs in the field. It won’t matter whether it be a fully automated system of smart contracts, ready to handle and enforce the most complex deals, advanced AIs that provide better help with stock markets and asset management, or more efficient use of Big Data to push personalized experience to new heights. FinTech continues offering innovation to the financial sector. Financial organizations compete, creating better technology and growing more experts. The tech evolves further, unlocking new opportunities for FinTech firms.